Two Rock Falls Rotary members reached milestones in Rotary membership: Art Johnson with 40 years of Rotary membership on December 1, 2018 and Pam Erby with 30 years of Rotary membership on January 1, 2019. Both were celebrated by the Rock Falls Rotary members and remembered for their years of service. Pam Erby was the first female invited into Rock Falls Rotary membership after membership was opened to females in 1988 by Rotary International. District Governor, Kathy Kwiat-Hess, had issued a certificate commemorating the achievement of both for their commitment of longevity to Rotary service. 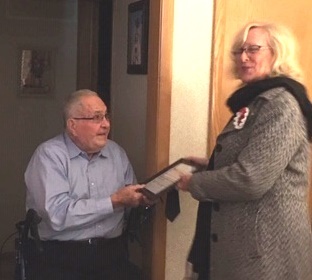 Cheryl Faber, Rock Falls Rotarian, presents to Art Johnson the 40 Year membership certificate from Rotary District 6420 Governor, Kathy Kwiat-Hess at his home. Rock Falls Rotary President Mike Albert presents to Pam Erby the certificate of 30 years of longevity of membership in Rock Falls Rotary issued by District Governor Kathy Kwiat-Hess.